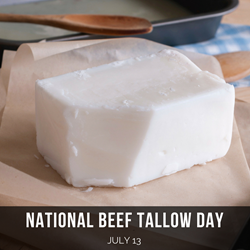 Coinciding with #NationalFrenchFryDay, the Healthy Fats Coalition (http://www.healthyfatscoalition.org - HFC) has proclaimed July 13 the first annual #NationalBeefTallowDay -- a celebration of beef fat, an authentic, traditional ingredient that brings out the very best in food. Like pure lard, duck fat, goose fat and other animal fats, beef tallow is now enjoying a resurgence within America’s food culture, in restaurants and fast food operations. #NationalFrenchFryDay, coinciding as it does with #NationalBeefTallowDay, is a prime opportunity for those who love French fries fried right to go back to the future. As food writer Nancy Luna recently mused in Nation’s Restaurant News, “Are French fries the new fast-food battleground? Fries have long been a staple on quick-service menus. But recently, the humble fried potato is undergoing a renaissance, with chains serving fries with a fancy twist.” A certain burger chain made its name in part through its beef tallow fries. As writer/social critic Malcolm Gladwell recently tweeted, https://twitter.com/gladwell/status/903273630070657024?lang=en. For more information on #NationalBeefTallowDay, email info@healthyfatscoalition.org. The Healthy Fats Coalition (http://www.healthyfatscoalition.org) is a new educational initiative comprised of those who understand that healthy fats are an essential part of the American diet. The HFC’s mission to create an enlightened conversation about the food we eat, though news and editorial commentary, social media conversations, opinion surveys and more. Healthy Fats Coalition supporters include: Amy Berger, Torie Borrelli, Jennifer Calahan, Coast Packing Company, Desert Farms, Diana Rodgers, FATCO, Fatworks, Fourth & Heart, HeartBrand Beef, iTi Tropicals, Lisa Howard, M.A.D. Foods, Nefertem Naturals, NTA, OldFarm, Sammy Pepys, Pure Indian Foods, Chef Ryan Ross, Dr. Cate Shanahan, Elizabeth Swenson, Tendergrass Farms, Weston A. Price Foundation.